Tankformers’ Eli Evans and Ben Searcy have claimed the 2018 CAMS Australian Rally Championship in an event of see-sawing fortunes at Kennards Hire Rally Australia. Contel Communication’s Steve Glenney and Andy Sarandis took the outright win at the three-day event but it wasn’t enough to wrest the title away from Evans and Searcy, who finished with a 19 point advantage. More than 83,000 people attended the three-day event, witnessing Evans win his fourth Australian Rally Championship and Searcy his first. Evans was full of praise for Searcy. For Searcy, finally winning his first Australian Rally Championship was super sweet. “It was amazing, it’s great. I’ve come so close the last two years in a row, to finally actually get one, it’s awesome, I’m stoked, really happy,” Searcy said. Things looked grim for Evans when he damaged the radiator on the Skoda Fabia R5 early on day one but two strong performances on the remaining days, and the high attrition rate as competitors succumbed to the tough Coffs Coast conditions, allowed him to finish fifth outright and gather enough points for the title. Evans fended off a strong challenge from Toyota Gazoo Racing Australia’s Harry Bates and John McCarthy, which ended prematurely with the Yaris AP4 suffering engine issues on day two, and from Glenney, who’s outright win was still not enough to bridge the points gap to Evans. For Glenney, who returned to the ARC as a driver this year after a time focusing on tarmac rally events, the Rally Australia round win was his first since 2006. “It’s fantastic, it’s been a huge year and a great privilege to drive the Contel Communications Subaru and then to step up to the R5 for this event was a great experience for all of us,” Glenney said. Second outright were rally rookies Luke Anear and Jon Mitchell, the duo doing a stellar job to keep their Subaru Impreza WRX STi out of trouble. Rally Australia was only Anear’s third gravel rally. “I don’t think I’ve come to terms with what we have done yet, its pretty amazing, trying to stay alive out there was the hardest thing,” said Anear. 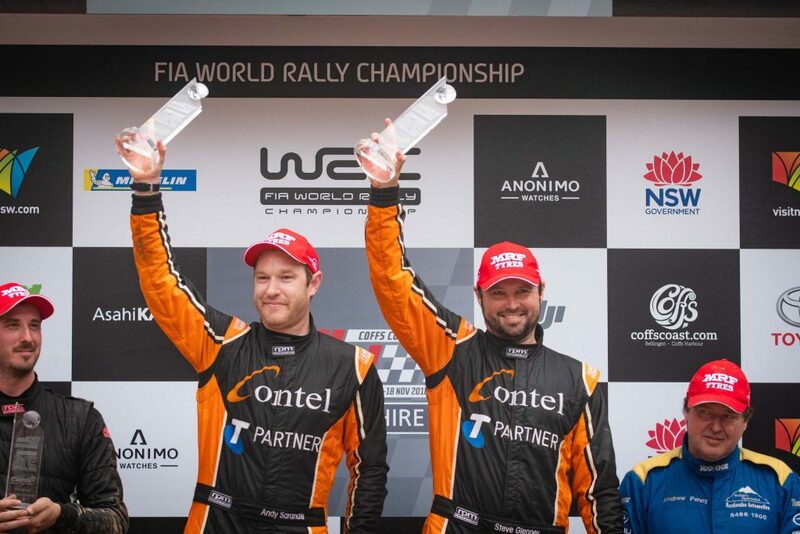 Andrew Penny and Rhys Llewellyn rounded out the podium in third place, the achievement a long time in the making for Penny, who had previously finished Rally Australia just once from five attempts. Their efforts also see them secure the CAMS ARC2 Championship, in what was a winner takes all final on the Coffs Coast. In Rally Australia’s 2WD class, Lindsay Collits and Brad Dawson claimed first in class in his Holden Commodore Ute, with Kevin Raedel and Anthony Carr second in the Ford Falcon and Ben and Cathy Hayes third in their Holden SS Commodore. Despite not finishing this weekend, Adam Kaplan and Aleshia Penney had enough points to claim the CAMS Australian 2WD Rally Championship.